Peanut Butter Cup Crack Brownies are completely over the top in the best way possible! Soft, fudgy brownies, with a layer of peanut butter cups, topped with a thick crispy peanut butter chocolate layer! These Peanut Butter Cup Crack Brownies are the dessert you should bring to any event where you want to seriously impress people. I can’t even begin to describe their deliciousness. They are consistently one of the most popular recipes on my website for good reason, EVERYONE LOVES THEM! So I started with a box of Ghirardelli Double Chocolate Brownies… they are some of my favorite boxed brownies. In all honesty I used peanut butter cup eggs that I have leftover from Easter. Shhh, don’t tell my kids. The chocolate will get melty. Pour that all over top of the brownies. Now let that chill for about 2 hours. When they’re set up you can dig in. Have your your local rehab facility on speed-dial. You’ll need them. Bake brownies according to package directions in a 9×9 pan lined with foil. As soon as you pull them out of the oven, spread the melty peanut butter cups/peanuts with an off-set spatula to smooth over top. Let brownies cool. Next in a microwave safe bowl combine chocolate chips, peanut butter and butter. Heat in microwave for 1 minute, stirring when done. If needed, continue heating in 20 second increments until chocolate chips are melted. Pour over brownies and smooth. Chill until chocolate is set, about 2 hours. Store airtight for up to 3 days. You can store these at room temperature or in refrigerator. Do you put them back in the oven after you put the peanuts and candy combo on the brownies that have 5 min left to bake? Yep, Pull them out when there is about 5 minutes left on the baking time, sprinkle the nuts and pb cups on top and place them back min the oven for 5 minutes to melt the chocolate, so you can spread it. i have just seen the next best thing to peanut butter and chocolate straight from the jar right here. I can use any candy bar right? because I have a load of butterfingers I need to use. Oooh, that would be fantastic!! 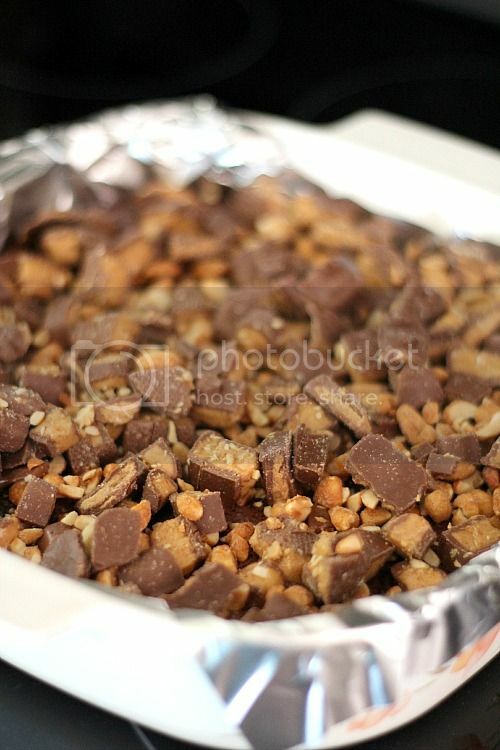 I was thinking butterfingers instead of nuts…..or heath bars….I will certainly experiment too. Oh my gosh these would be so good with Butterfingers! Yep, these are like amazing! Love you added the crunch on top! These look so crazy-delicious!! Yum! I would prefer it without the peanuts. Are the peanuts necessary to hold the chopped Reeses together? I’ve made these before and they really are addicting! These look perfect in every way! Yum. I was REALLY afraid to click this link! I’m off carbs, too. I don’t even know why I look at this stuff. Lol! Wow! I don’t have many words for this sort of dessert! Uh yeah crack is right. These should probably be a controlled substance…not that that would stop me from eating a whole pan. Oh My Gawd. Can you mail these to me — no seriously?? Oh this is just no good for a sweet junkie! I approve. WOW! I want!!! These are so so so awesome!! And I thought life couldn’t get any better after Nutella crack brownies…boy was I wrong! Do you have a recipe for this? My kids are in a Nutella phase right now. Yes, we shall gorge us. Er, ourselves. Gorgeous, indeed! I’m dying. Please move next door to me and be the best neighbor ever. I can’t wait to get these in my mouth! Yum! I love anything chocolate and peanut butter. And I like the addition of the cereal to the brownies! I can definitely see these being dangerous in my house! They look amazing! Serious question here: I’m very curious as to what the food bloggers, especially the baker’s, do with all the treats they make? I’m assuming your neighbor’s love you. If I baked all the time I wouldn’t fit through the doorway! These brownies look fabulous, by the way! I bake for my husband (LT), son’s (dispatcher) and local police departments! Plus my co-workers and doctors offices love them too! So many bad things into one piece of brownie!! They look so good though. definitely not for every day eating!! Oh my gosh, woman! You’re krispie creations are out of control now!! I will probably toss and turn in my bed at night thinking about this! And…will have to wake up to make them, I’m sure! Crack sounds about right. This whole pan would be gone so fast! Love the combo of Krispies in the topping! The “Rice Krispie Queen” wins again! I just made brownies this morning for the boys’ breakfast “snack”…but now, I think I might have to toss those out and make these asap! Two of my fav things together! Love the krispies on top. You crack me up. Every time you post something. And everything you post is mouth-watering. And it could be because of you, that my scale is heading upwards… And quite frankly, I’m okay with that! I can not WAIT to try these! Thank you! I had a crappy day and right now I just want to put on a pair of sweat pants, turn on Real Housewives (because Real Housewives is pretty much on 24/7, right? ), and eat a whole pan of these. They look SO GOOD! These are too good to be true! Crack indeed! These look incredible! Holy what!? These look like pure amazing! I don’t know why I’m always so surprised at how awesome the recipe you’ve shared this time is. But yeah, yum! Hello, friend. Is the house next door to you for sale? Do you need a house guest, perhaps? Someone to fold your laundry? Can we use 8×8 pan for this? You could, but the chocolate layer on top might be a bit too thick. If you use the 8×8 I’d cut the chocolate back to 1 1/2 cups and the pb back to 3/4 cup! Cut Back? That is a sacrilege to this recipe. I want to know if doubling it would work well in a 9 x 13 x 2 baking pan. I would try it but I am an inexperienced baker and would hate to waste a lot of expensive ingredients on an experiment. This recipe sounds great! 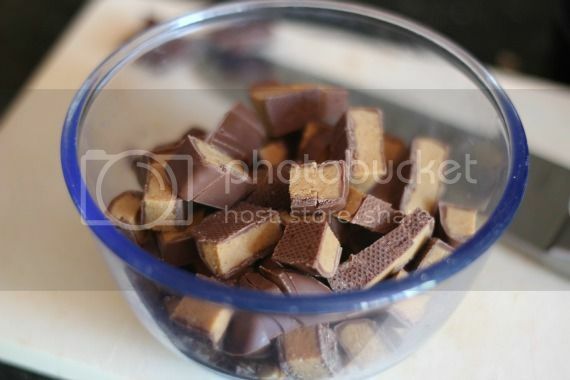 The other ingredients, I would increase the chocolate chips by 1 cup and the peanut butter by 1/2 cup, and the krispie treats by 1/2 cup. I don’t think you could mess it up! Join the Are the peanut butter cup the mini or full size? Dang those look pretty damn good. I do love me some Reeses! A brownie addiction. There could be worse things, ya know! I made these last night and my girls and I just tried them-OMG! We’re in a sugar coma now, and it’s totally worth it. I’m taking these to a dinner tonight, and I’ll be surprised if any of them make it home! BTW, I made these in an 8 x 8 pan, and didn’t reduce any of the recipes. They still turned out great…look forward to trying more of your recipes. Awesome! Glad to hear that it worked fine in an 8×8! BTW, I made these in an 8 x 8 pan, and didn’t reduce any of the ingredients. They still turned out great…look forward to trying more of your recipes. I am pretty sure that’s why four pound buckets of peanut butter remind Glory of you, lol! True story! Was looking for a dessert to take to the school book fair on Monday. Found it! Thanks! Oh. My. Goodness. 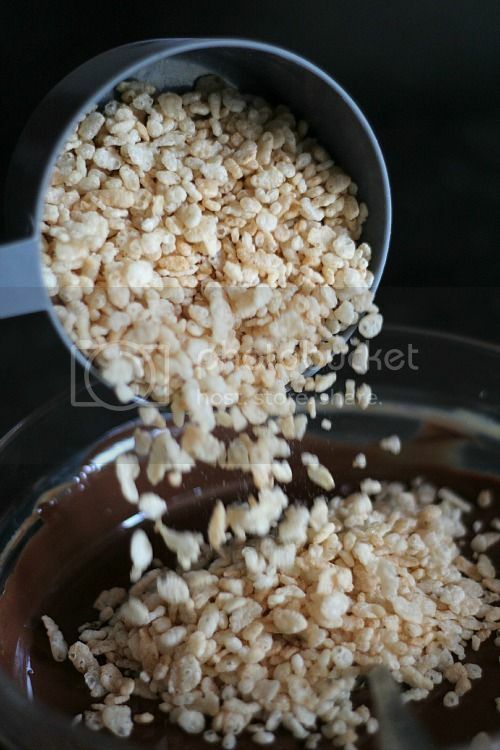 Love the krispie cereal – chocolate – peanut butter layer – pure awesomeness! The pan size has been discussed already, but I wanted to clarify: the original BHG recipe calls for a 9×13 pan. So you just opted for the 9 inch pan and kept everything else the same, right? Did you really get 25 out of a 9 inch pan? Well, I cut them small, because they are a little thicker. I tweaked some of the ingredients in the BHG recipe slightly to suit my taste, like adding more krispies…but I just prefer a thicker brownie! Made these, INSANELY GOOD! They rocked, I rocked them. I bumped the recipe up by about 50% to accommodate a 9×13 pan and used my go-to non-mix brownie recipe and despite cooking them at 350 instead of 325 for 35 minutes which made them weird like crumbly cake they were still awesome. I can’t wait to try them with proper brownies for the base!! You rock girl! Crack is a good name! OMG these are so incredibly WONDERFUL, I’ve made them 3 times because after I made them the first time everyone requests them !!! Just made them again this morning and noticed the last ingredient is kosher salt (somehow I have missed this every other time I’ve made them) but I don’t see where to add it. Do I sprinkle on top ? Or add to the krispie mix ? question- i have the mini reeses. do still do 12 or should I add more? funny I didn’t read all the comments before sending my hubby to michael’s to get a 9×9 pan. I hope to get reply before baking? What do you do with the salt? Oopsss…..didn’t read all the way hrough the comments…..
Can cashews be used instead? Oh I bet that would be great!!! sooooo, i have finally managed to round up all of the ingredients for this. they are patiently sitting in an Asda bag in my cupboard… hopefully tonight will be the night! I had to come to your blog to read the complete instructions. somebody passed just the recipe to me and you don’t say what to do with the salt. I found it when I read the blog post, line by line, but you might want to add that to the “How to Make” section of the recipe. I have made these already without the sale (since I didn’t know where to put it)… and they were DIVINE! Everybody wants the recipe! So much danger here… delicious danger! Your blog is my recipe go-to. I know that whatever sweets I’m looking for, I can find them here. 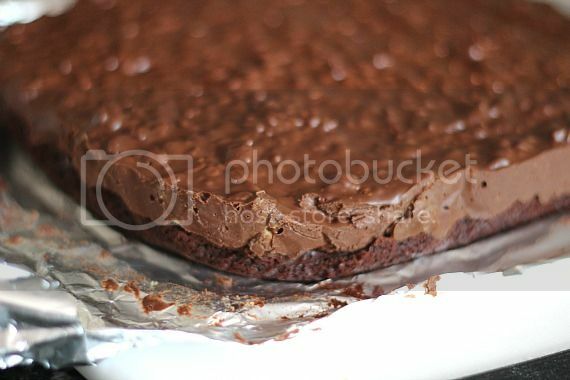 These brownies look amazing..as do all your photographs. Thanks for another great “keeper”! 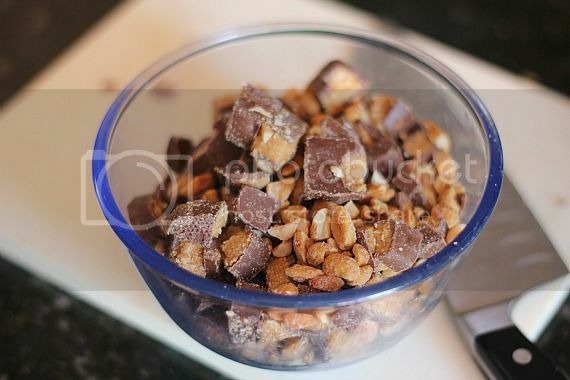 Why is it peanuts and chocolate go so well together? 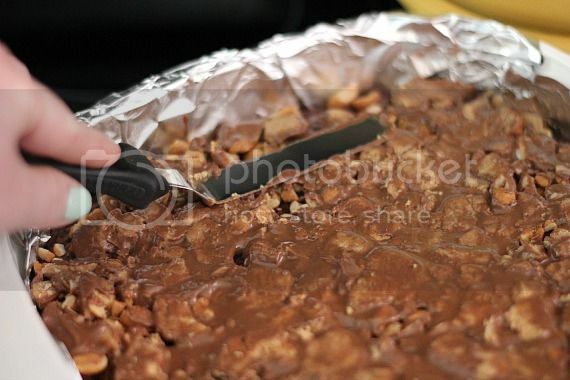 Great photos, I didn’t even get down to the ingredients list before drooling uncontrollably. First, “Let that situation cool.” Haha…I love your way with words, Shelly. These look as evil as my bodacious brownies, I have to try these I like the rice crispies in there, that is interesting. I may add some instant espresso like mine have for that extra buzz!!! I bet that will be great! The funny thing is that you can actually HAVE leftover Easter candy!! Any type of chocolate candy will work! Can’t wait to make these tomorrow. But I’m just curious, what’s the difference with the family sized box of brownies (of course I looked at what I had and that was ALL I have!!) I could get another box tomorrow but I was just curious. Thanks so much Shelly and love love love your blog and ‘low calorie’ (ha ha) recipes!! Just made these tonight and the picture looks like much less topping than I had. The ratio of topping to brownie/cups is more than 2:1. I’d make them again but cut the topping in half so you taste the brownies more. Thanks- great sugar buzz! Does anyone know if these freeze well? Would like to make them ahead of time and freeze them for a special event..Thanks! Can we be neighbors? Pretty pretty please? Oh. My. Gosh. NEED these in my life… like the entire plate. Oooh. So mesmerizing! I like what you did here. I am a little confused about using that much salt. Also I can’t find where it is to go. Do you add it to the chocolate chip part ? Maybe using 1 teaspoon of salt is a typo ? You can add 1/2 tsp if you think that you might not like the salt…it’s all personal preference. I like the salty in my sweets, so I tend to add more. Start with less and add more if you feel necessary. Also, I added it when I added the vanilla and cereal. I adjusted the recipe to read more clearly on that! Thanks!! 🙂 I just was searching for this to show my mom, and simply put “crack” in the search since I couldn’t remember the exact name! It worked!! i made these for a bbq. I set them out and within a few minutes they were gone. Everyone raved about them and if there was an award for best dessert these would likely have won. Super easy, will definitely make again! These are UNREAL. The best brownie/bar/chocolate/peanutbuttery thingy I have ever made! However, addicting? beyond addicting. Also, I think my recipe builder put these bad boys out at about 600 calories per square! Worth it? YES. hands down one of the best things ive ever made! the rice crispies give it such a fun texture! I wish people would refrain from adding “crack” to the name of their recipes. Why give something good a bad name. Can I use the mini peanut butter cups? If so how many do I use? Thank you! Did anyone have trouble with this not baking in the center. Edges baked nicely but center gooey as can be. Do you think I can freeze them, after I cut them up…? Who ARE YOU??? OMG these are a DREAM COME TRUE!!! Perfect in every way!!! My fav brownie mix too! Reese’s eggs ARE THE BEST! Somehow they just seem more peanut buttery. Looks like you cut off the edges of the brownies so they are PERFECT!!! I LOVE YOU!!! What can I use to replace peanut butter cups as those are not very usual in Denmark. My son FB’d this recipee to me as my homework assignment? I think I’ll surprise him and actually do this! As a general rule, if you have to ask you don’t want to eat them. Made these this past weekend, and they were AMAZING! I want to know if I can double the recipe and put it in a 9 x 13. Have you ever tried this? 1 question~ regular size peanut butter cups? These are really good, but in my opinion the top layer is way too thick. I could see from the photos that it would be, so I intentionally used a 9×13 brownie mix (and 6 extra peanut butter cups) to spread out that top layer a bit. I like the top layer as an accent to the brownie layer, but this just overpowers it, even with my adjusted ratio. Next time I will halve the part of the recipe for the top layer. I tried these at a friend’s gathering, and they were delicious! Do you have to use the peanuts? I think my family would prefer it without. Made these last night for the office and everyone loved them!! Thank you so much!! Can I omit the rice crispy cereal? But why did they rate only 2 1/2 stars ? I’m finding this recipe name really misleading – “crack” isn’t even on the ingredient list! BEST BROWNIES IVE EVER HAD! I just made these the other day and could have eaten the entire pan by myself. I used snickers in place of the peanuts. Other than that I followed the exact recipe and they turned out amazing. Seriously these are my new favorite brownies. Thank you!! 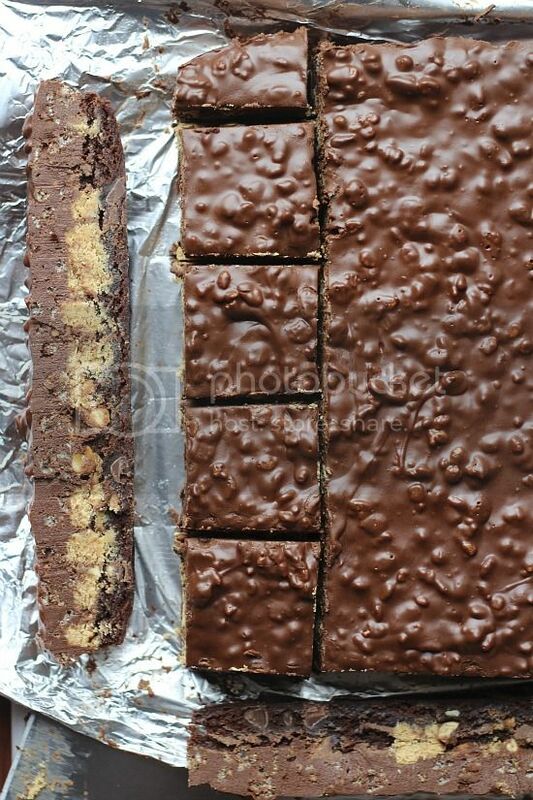 Is there any reason I couldn’t make the make these with the family- sized box of brownies and then just increase the other ingredients? So does anyone know how many calories this is?? Hi Shelly! I’m making these tonight with a friend for the first time! I’ve wanted to make them forever, but always wanted a good “reason”. Well my friend and I decided who needs a reason! Can’t wait to try them! Made these for our Daytona party today and they were a huge hit! 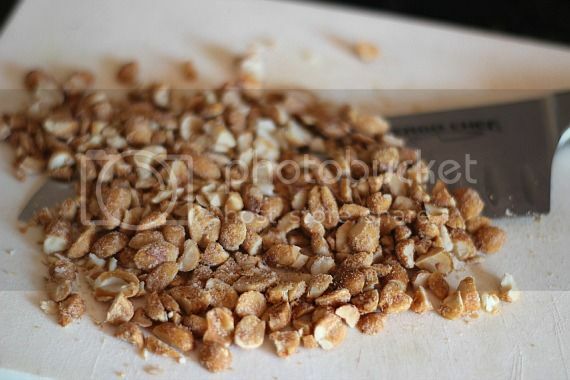 Everyone agreed that that dry roasted peanuts help keep them from being overly sweet! I came home with an empty plate an many compliments. Thank you for sharing this great recipe! I don’t know if I can forgive you for these, they are so good. I saw this recipe on Facebook and made them, making sure I put together a little bag for a friend who loves peanut butter cups as much as I do. I took a bag for my friends in a fishing trip, and a bag for my friend. Both bags were eaten. Guess my friend is SOL. Thank you for this evil! 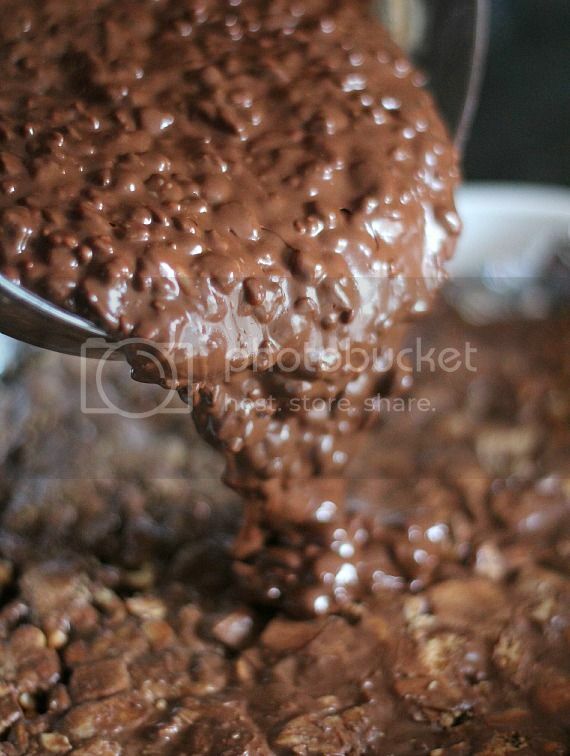 I have found that whenever I mix crispy cereal with melted chocolate chips, they get soggy. Does anyone have a tip on how to keep them crispy? What am I doing wrong? Are you using Rice Krispy cereal or a different brand? 12 regular size Pb cups? can I use plain peanut butter instead of candy? How much would you guess to use? Just made these for a potluck with my choir. Fantastic! I knew I had to try them but didn’t trust myself to have them in the house. I thought about making them in a 9 x 13 pan so they’re not so thick. Would it be possible to use WOWButter in stead of real Peanut Butter?? I made these but didn’t care for them. The peanut butter/chocolate chip/crisp rice topping was way too thick for my liking and that of my family. If it had been half or a third, maybe that would have tasted better for us. I found myself slicing most of it off when I would cut a brownie square. Sorry but it just wasn’t for me. These brownies look amazing! DO you think you could use natural peanut butter? I don’t have any PB cups and can’t get out to get any, but would like to make this for a “Thank You” treat. Do you think that I could somehow use PB for that layer (maybe mixed with a little confectioners’ sugar (if thickening is necessary, for example) ? If you think that this might work and could give me an idea of how much PB to try, I’d appreciate it! Funny how all these recipes always start with a boxed mix. If you’re really cooking or baking, why can’t you make a simple brownie or cake recipe? Just because we like sweets doesn’t mean we like the junk that passes for ingredients in packaged foods. You can certainly start with a scratch brownie recipe if that is what you prefer. It’s certainly a personal preference. I have boys that stay with me, ages 19 and 32 and always have strays that show up too. I am gonna make their day when they I make these!! They look AMAZING!! Thanks for the recipe! Is it 1 and 3/4 cup cereal, or 3/4 cup cereal? I hope this question has not been asked already. So many comments and not enough time to read them all right now. I assume you used full size peanut butter cups and not the minis. Did I assume correctly? Yep! The regular sized peanut butter cups! These are AMAZING! had them at a party and immediately had to try it myself. everyone who had one LOVED them! The peanut and chocolate layers are so delicious, I want to try it without the brownie layer next time. Has anyone tried this? was it successful?